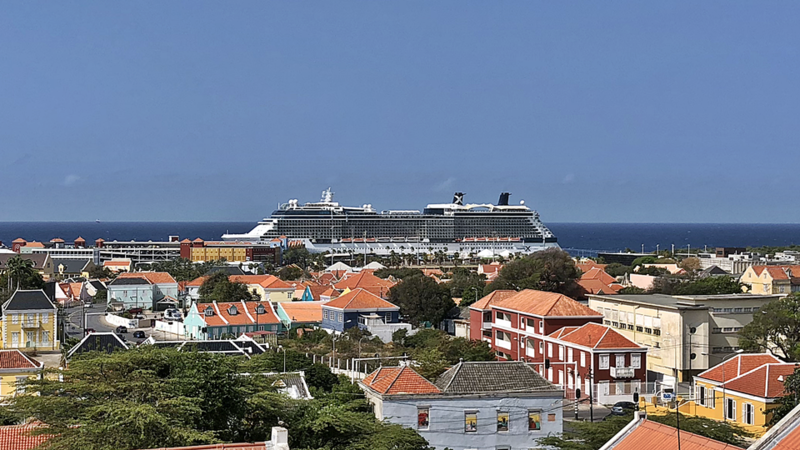 An Eight Night Family Cruise to the ABC Islands! Celebrity Equinox For Diane and I, this was our second time sailing on the beautiful Solstice-class ship, Celebrity Equinox. Our last sailing on her was three years before in 2015. This ship was just as amazing as we remembered her. Celebrity, without a doubt, maintains the highest quality in service and amazing food! Even at the ship's buffet, the food is top-notch! We had the drinks package on this cruise which was included as part of a multi-perk choice for signing up for this cruise. The other perks we chose were a $300 on board credit (OBC) and pre-paid gratuities. This was an amazing cruise as well as it was a family trip including my sister and my bro-in-law, Patty and Mac, and my brother and sis-in-law, Jimmy and Liza along with Diane and I! 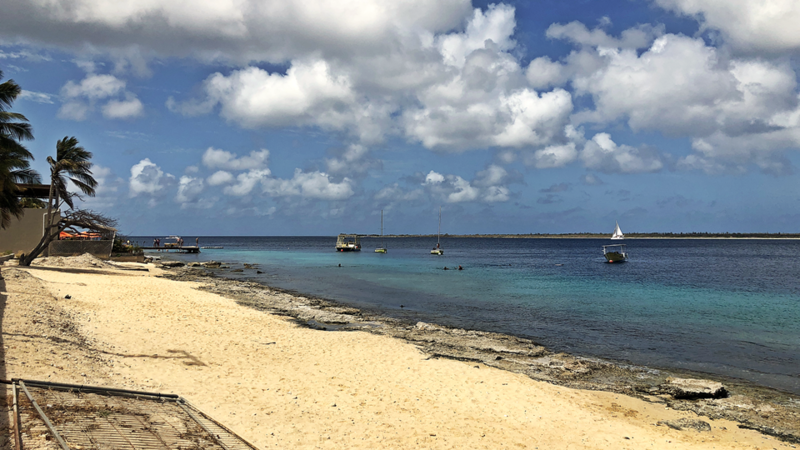 The itinerary, being the "ABC" islands, included Aruba, Curacao and Bonaire. 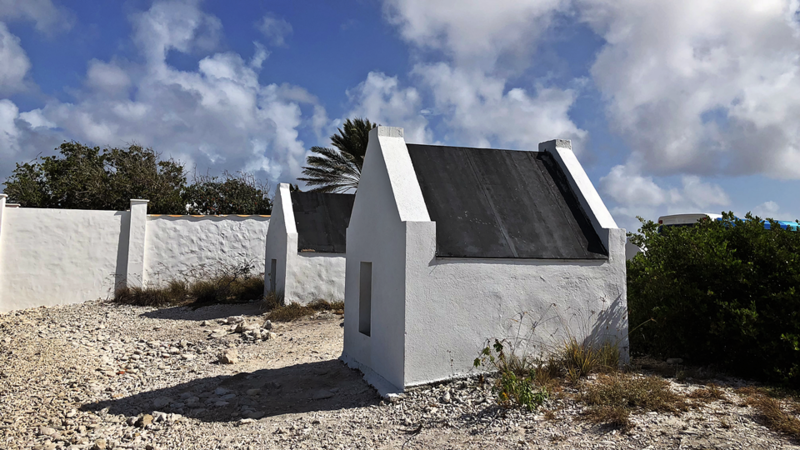 We were especially excited to visit Bonaire for the very first time. 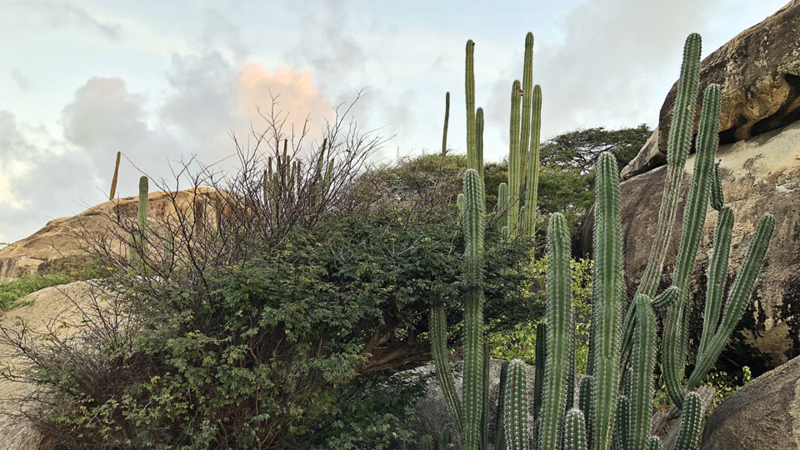 Aruba and Curacao are always favorite stops for us! Pre-cruise Hotel When a port is far away enough that we must fly to it, we always go to that port city at least a day before the cruise. (It's a foolish, stupid gamble to fly to a port city the day of the cruise) I don't always talk about the hotel in my cruise reviews but on this trip, we were so impressed by the awesome Atton Brickell Miami (https://www.attonbrickellmiami.com/) that I had to talk about it here. It's a very new, clean and ultra modern hotel and it's location about a five minute drive to the port is ideal. It's also within easy walking distance of restaurants and stores and pharmacies (two literally across the street). It has a very cool pool deck up high with impressive views. The rooms are nicely appointed and the bathroom is luxurious! I thoroughly recommend this hotel for any pre-cruise stay! Atton Brickell Miami... Awesome Pre-Cruise Hotel! Our stay in Miami was really nice. We ate lunch downtown (we walked from the Atton) and later we picked up a few things in a local store, then we spent the afternoon lounging about the pool. That night we ate a wonderful dinner (treated by Jimmy and Liza!) at the Rusty Pelican (we drove there)! We ate outside with magnificent sunset and night views of Miami across the water. Later, back at the hotel, we all retired to our rooms (travel day had all of us up early!). We all had breakfast at the hotel's nice buffet before grabbing our transportation to the pier. Liza, Patty and Diane at the Rusty Pelican... Pre-Cruise Dinner! Arrival at the Port of Miami and luggage drop off... Me, Liza, Diane and Patty! 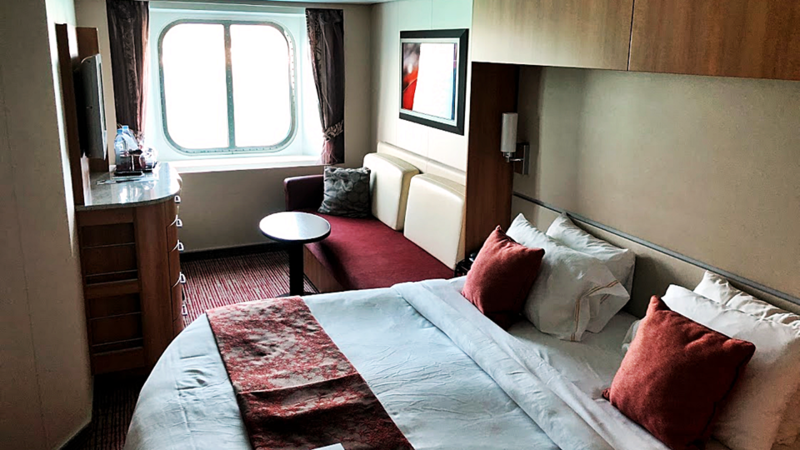 Our beautiful and comfortable "outside" cabin on deck 3... perfectly located! Ship's Pool and Recreation Areas Diane and I love the pools, and spa and recreation areas of the Celebrity Equinox (as on all Solstice-class ships)... but hands-down, our most favorite spot aboard these is the ship's adults-only Solarium. Completely enclosed against the weather, and featuring comfortable cushioned lounge chairs, half-shell love seats and all sorts of other unique furniture, and a pool and a large hot tub on port and starboard along with dazzling fountain and light show on one wall... and a healthy mini eatery... what's not to love? If you can't find us on any day when we aren't in port, we're in the Solarium for sure! The Solarium glass roof is lined with a grid array of small solar cells which provide some free energy to the ship... and I've got to believe that they also provide a reduced solar exposure to the people at this location. Double win! 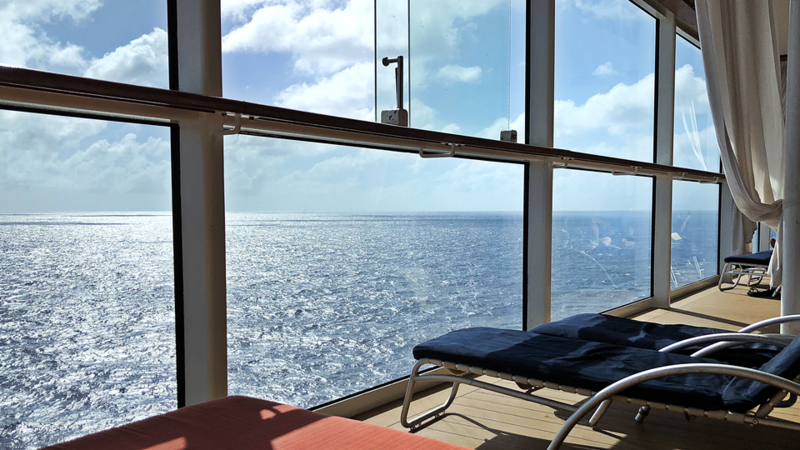 The line also sports it's Persian Gardens (fee based unless you are in an aqua-class cabin)... heated tile beds in an arc facing floor to ceiling windows looking out to the sea along with rain forest showers and aromatherapy steam rooms. Awesome! The main pool area consists of two pools (one often devoted to sports events like crew vs. passenger volleyball and one for open swimming) and four hot tubs. There are also amazing lounge chairs, "A" frame beds (free, first come, first serve), and lots of shaded and out in the Sun spots, and beds and a hammock bed. There's a fountain platform that you can walk across that does whimsical stuff throughout the day and also puts on a pretty light show at night. The pool areas aboard are stunning all day and all night. Daybreak over the main pools... note the "A" frame beds! Seven AM at the Main Pools... a great time to get pictures before the crowds! The Solarium before the crowds! Note towels on each chair... classy! Diane and I already staking our location in the Solarium on Embarkation Day! Love this place! Ship's Bars and Night Clubs Without a doubt, the Solstice-class ship's most popular bar aboard (and there are a lot of awesome bars on this ship class) has got to be the Martini Bar, and this is definitely true on the Celebrity Equinox! 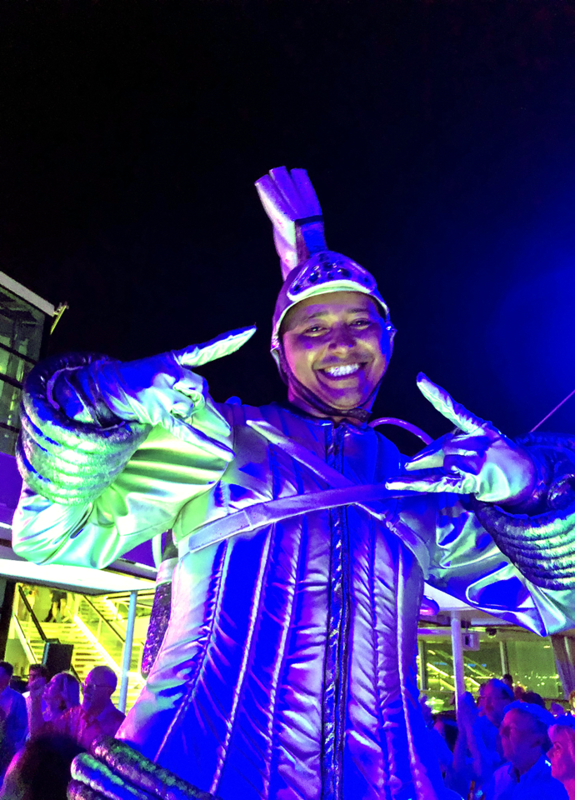 From the frozen bar surface, to the antics and drink prep shows of the Martini Bar bartenders, to the fantastic martini menu... it's the ship's must-be place between dinner and a show or post shows. Our other favorite is the Sunset Bar directly aft and top-side. 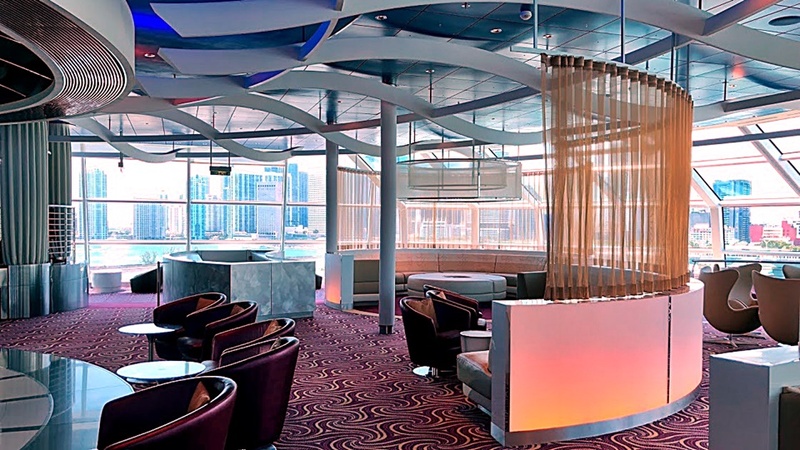 Rounding out our favorite bars is the Sky Lounge top side all the way forward. It's amazing views of the ocean make this a fantastic place to relax during the day, viewing through the blue tinted floor to ceiling windows while sitting on unique chairs and sofas! At night, there's often a live band and dancing. (Note... this also serves as an early evening stop for Elite Captain's Club members for complimentary drinks and hors devours for a few hours each night) As far as night clubs go, the Quasar disco has seen better days. It's largely empty on most nights which is sad because with the right DJ, this place could be awesome. 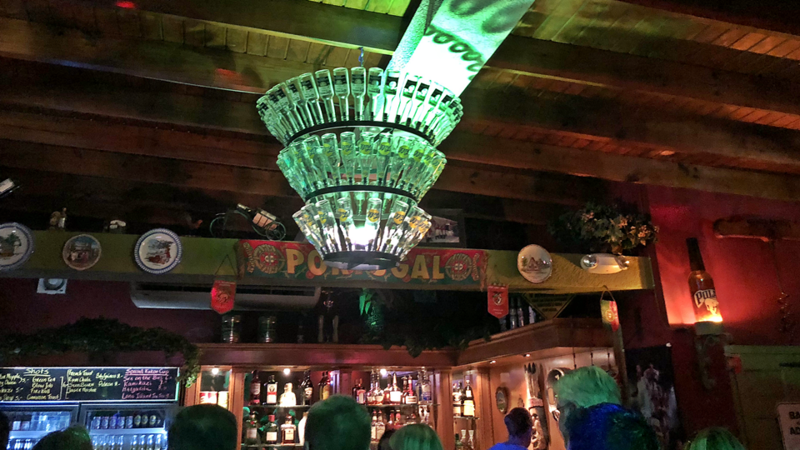 There are many other venues and bars aboard and they are all fun places to stop (although I still don't get the Molecular Bar) but these are our favorite. Me, Jimmy and Liza living large at the best Martini Bar (frozen surface) on the seven seas! The beautiful Sky Lounge - best views forward! 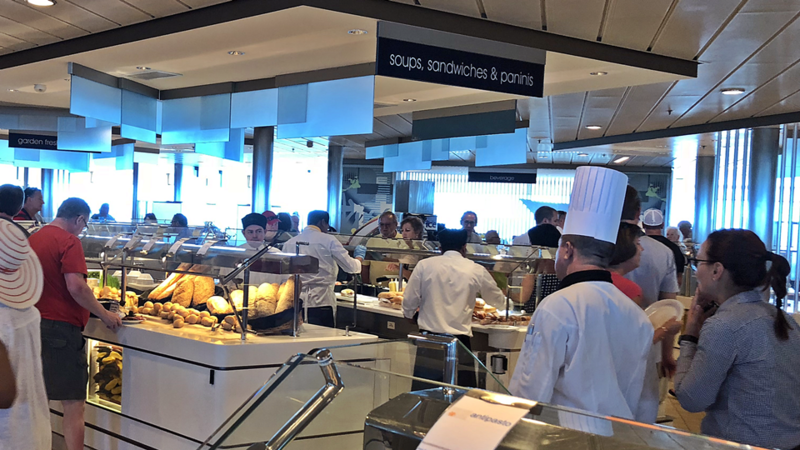 Ship's Dining Experience Truly... no exaggeration... there's not a single spot aboard any Celebrity Solstice class ship where you'll have a bad meal. Even the ship's buffet is amazing! 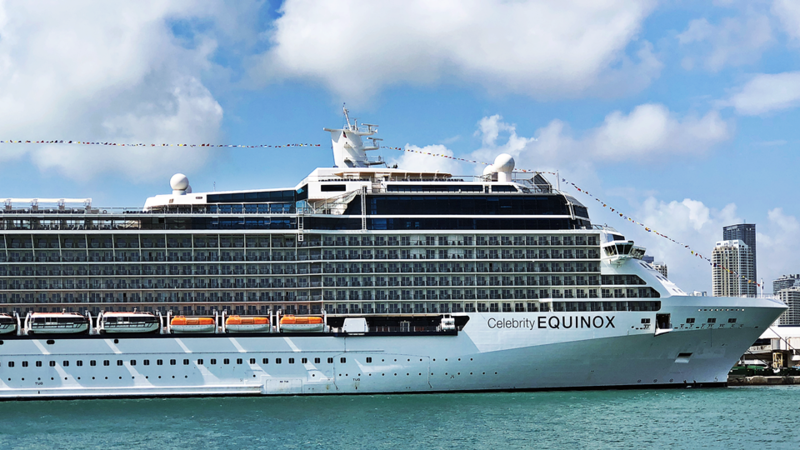 About the only bad thing about eating on the Celebrity Equinox (and her sister ships) is that you'll definitely put on some weight. Every bite will be worth it! 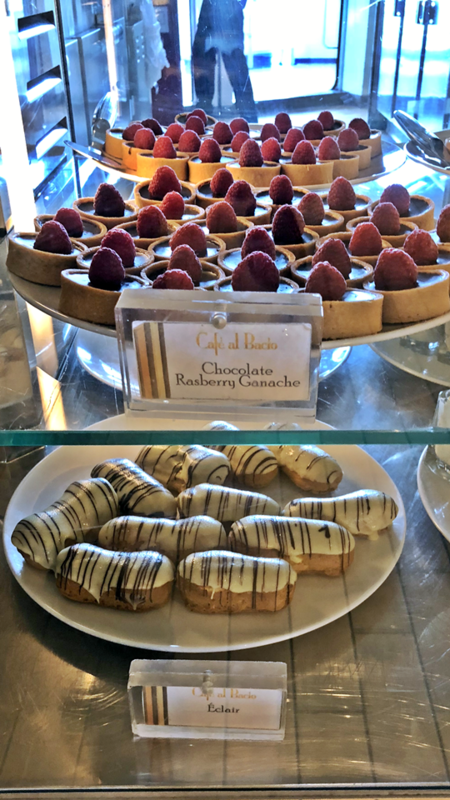 Oceanview Cafe (free): This is the Equinox buffet, and as I have said over and over, Celebrity buffets are magnificent! Food and service here is top notch, and I actually can't wait to get aboard and have this buffet available to me. Many selections, carving stations, foreign fare, themed areas... and pizza and pasta for those wanting something simpler. There's great seating throughout, but our favorite is all the way aft at the tables outside looking directly aft. The Oceanview Cafe is open from about six am serving various meals through the morning, noon and night and generally has snacks till 1am. 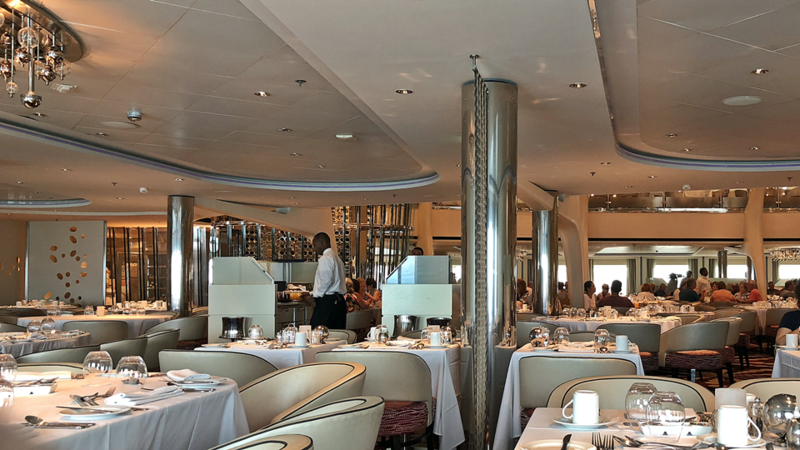 The food is so good here that we wouldn't mind doing dinner here if the menu in the ship's Main Dining Room didn't please us. It's that good! Silhouette (free): Silhouette is the Equinox Main Dining Room (MDR) and as on all Celebrity ships, this is the premiere sit down restaurant for breakfast, lunch and, especially, dinner. We had the second seating (8:30pm) and our wait team was the best... we will never forget our waiter, Moses, who's signature description of every meal favorite was, "ooh la la, yummy, yummy!" (which always had us in stitches) and his fun assistant waiter Lisa (pronounced Leeza). Our table was a table in a secluded spot near the massive wine storage wall unit (looks like a giant sculpture) and it was just the six of us, so we had a blast every night. Every meal here was superb... rolls, spreads, appetizers, entrees, desserts... all five stars out of five. Only on Celebrity! Tuscan Grill (fee): This is the ship's steak house and it never fails to please. Set aside a few hours for this sumptuous multi-course extravaganza. Tremendous dishes in a venue directly aft with floor to ceiling windows and amazing views of the ocean! All six of us ate here one night and we had a great time together! 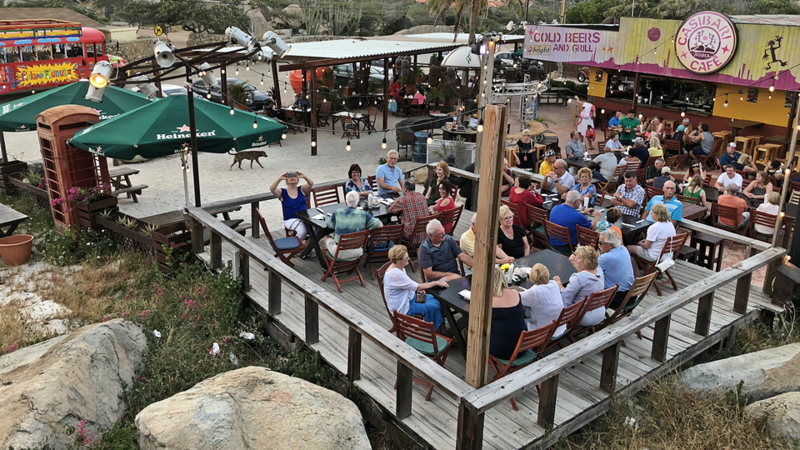 We were departing Curacao on our dinner night here... it was fun watching the island slide away as we feasted on a sumptuous meal. Sushi on Five (fee): This restaurant has gone through many names over the years. When Celebrity Solstice (the first of the five sisters) debuted back in 2009 this was basically a crepe restaurant. Then as "Bistro On Five" it was a regular sit down restaurant with a unique menu. All the past incarnations met with mixed success. But Celebrity seems to have hit the nail on the head with Sushi On Five. Great sushi and sashimi and a nice atmosphere with windows looking out to the promenade, this place on deck five should be visited at least once during any cruise. Patty and Mac and Diane and I ate here on our first sea day and we all had excellent food. Cafe Al Bacio (free/fee): Free snacks and possibly fee based coffees... not sure as I don't drink coffee. We always love the small cakes and gooey desserts at this unique spot. The Gelato place (fee) is near and serves up some delicious flavors of gelato and certain times of the day. Just a tiny selection of the desserts at Cafe Al Bacio! Mast Grill (free): Pool deck outdoor grill serving up delicious burgers and hotdogs and french fries. Convenient to pool, but there are also tables here. 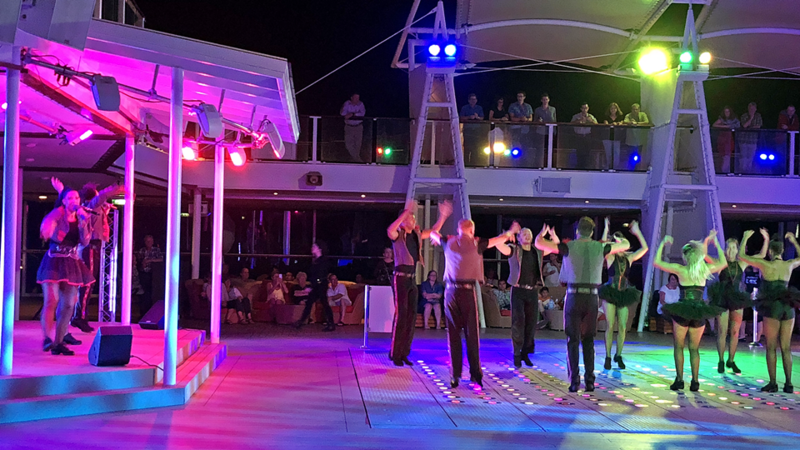 Ship's Entertainment Shows aboard a Celebrity ship are always amazing. We never miss a Celebrity production show. Celebrity Equinox's shows were fantastic, as always! Ship's unique or new features Again, as in previous reviews on Solstice-class ships, the standout unique feature aboard is the Lawn Club and it's real live grass. 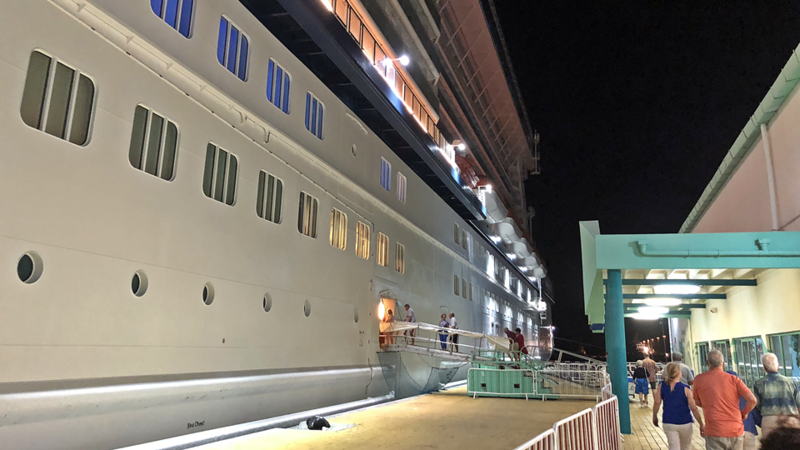 Although this might seem tired in today's ships with bumper cars and endless water slides, it's still a testament to what Celebrity aims to give its passengers: a nice, relaxing cruise. Being one of the first Solstice-class ships, Equinox does also have the Corning Glass blowing shows here as well. (This was discontinued on the last two Solstice-class ships, the Silhouette and the Reflection.) A not so unique, but uniquely placed spot is the ship's Persian Gardens... essentially a section with 8 or 9 heated tile beds all arrayed along tremendous floor to ceiling windows looking out to sea! This is something everyone on a Solstice-class ship should try. (Note to Aquaclass guests: it's already included in your fare) The steam rooms and rainforest showers adjacent are excellent. We also love the ship's often forgotten Sunset Lounge bar all the way aft. 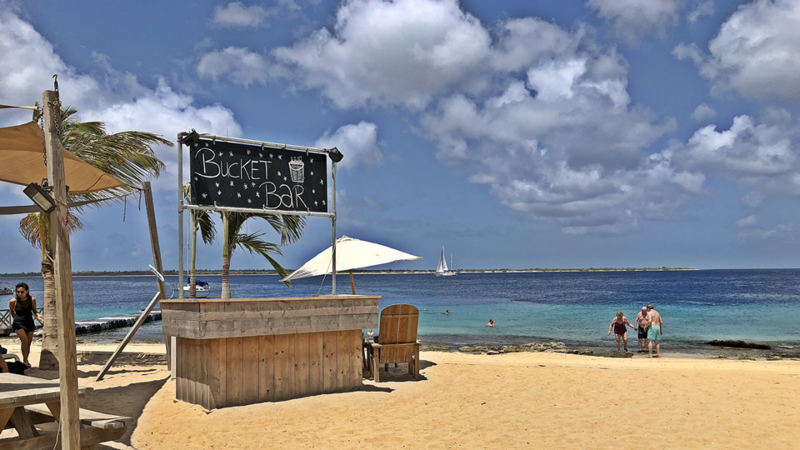 Stunning views with a drink in hand as you depart an island! Celebrity Equinox Lawn Club at Night! Our Itinerary We called this the "ABC" island tour as this is how these three deep southern and adjacent islands are often referred to... Aruba, Bonaire and Curacao... although to be honest, the itinerary order on this cruise, going west to east, was actually ACB! 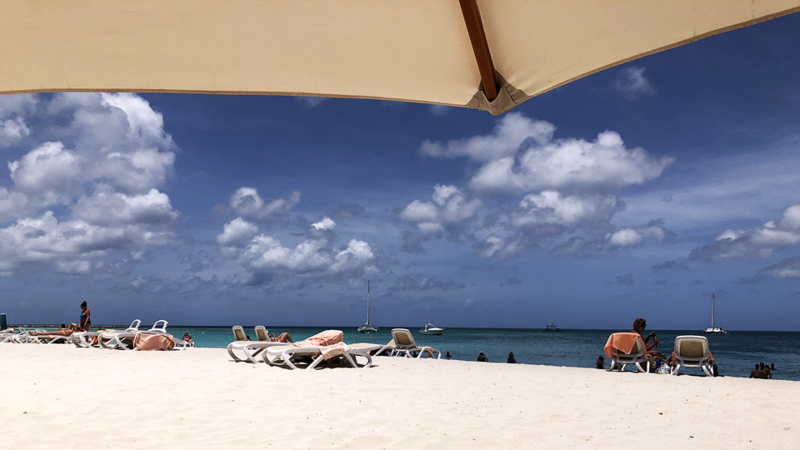 We've been to Aruba and Curacao on many occasions on past cruises but we've never been to Bonaire, so having this in the mix made it an easy choice. 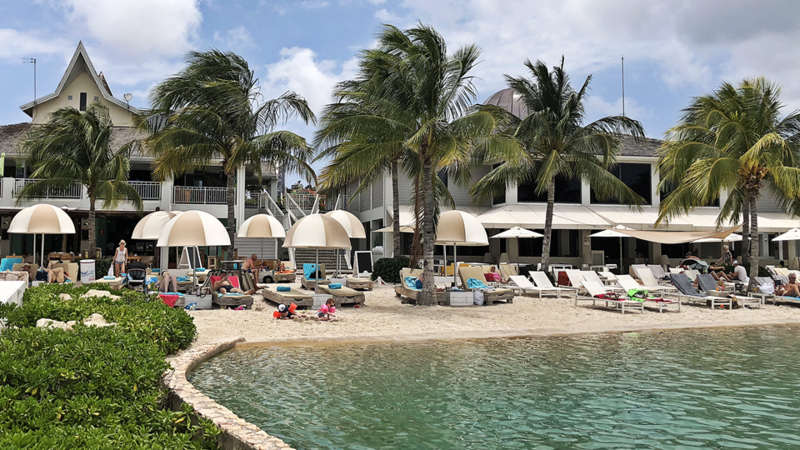 The trip also threw in 2 days at sea going south to the trio of islands from Miami and two days at sea returning north to Miami... and days at sea are pure decadence on any Celebrity ship sailing. (I keep saying I want a cruise that is just all days at sea... maybe a Trans-Atlantic?... on Celebrity! Who needs ports?) I won't go into details on what we did at sea other than to say they were days well spent in the Solarium, in the Persian Gardens (ahh... those heated tile beds! ), eating delicious meals and seeing magnificent shows! That should cover the four days at sea very nicely! Of the island stops, I'd say Aruba was our favorite, Curacao came in second, and Bonaire was in last place. 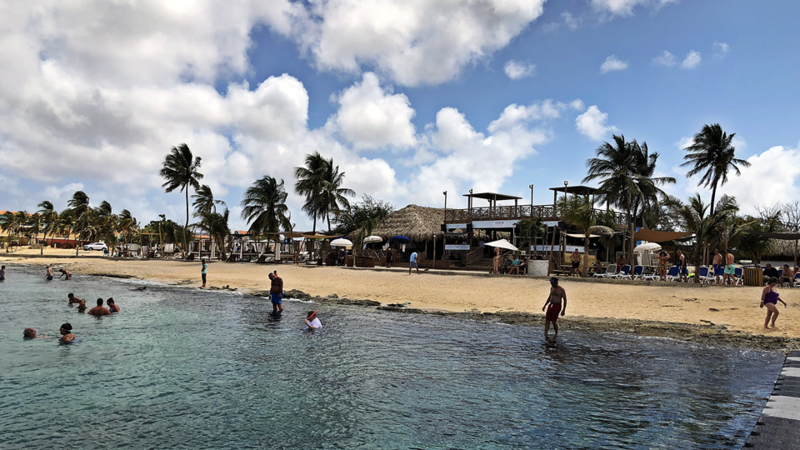 I understand why Bonaire isn't a typical stop on cruise ship itineraries now. More below. Aruba (April 10) We've never had a bad day on any visit to Aruba, and on this trip, Aruba continued to please! Jimmy and Liza and Pat and Mac opted to do an island sea and land tour so we didn't see them till later in the day. Diane and I struck out on our own after an excellent breakfast in the ship's Silhouette Dining Room. We grabbed a cab at the pier to Palm Beach... about a 15 minute drive ($14 one way). The driver dropped us off adjacent to the all-inclusive RIU resort (no, you can't use their facilities) on a gorgeous beach. Near us was a pier/restaurant with shops and gelato place and restrooms. There was also a chair and umbrella (a massive umbrella) rental for $55... all in all, this was much cheaper than a Celebrity excursion, however you must always remember that you're on your own if you aren't on the cruise company's sponsored tour. We had a nice day, but as it went on, the wind kicked up, so we decided after four hours on this world class beach, we'd head back to the (empty) ship for lunch and some light port shopping. Dinner tonight was all of us on the not-to-be missed "Kukookunuku Bus" (We did this 18 years previous on our Majesty of the Seas cruise and loved it then as well! 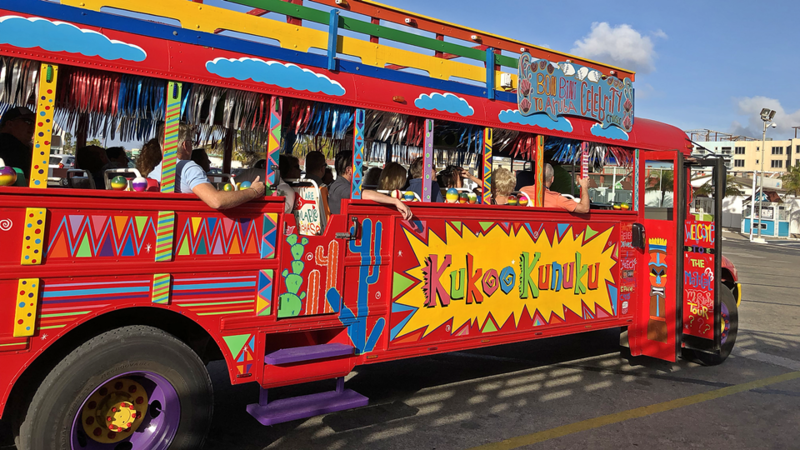 This tour features incredibly festive and funny open-air buses and zany crew (complete with noise makers for all) which pick you up at the port around 5pm (the ship is in Aruba till midnight) and take you to a secluded beach for a champagne toast, then they drive you into Aruba's central desert region to an outside restaurant where you get a free alcohol drink and a BBQ dinner. 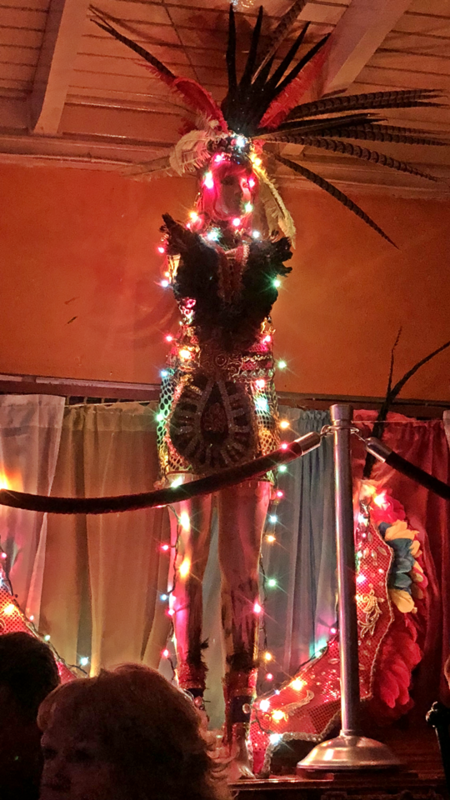 Then, after dinner, they whisk you about from one bar to the next where you spend about an hour (with a free drink at each) of drinking and dancing and merry-making visiting three otherwise sleepy bars around the island! 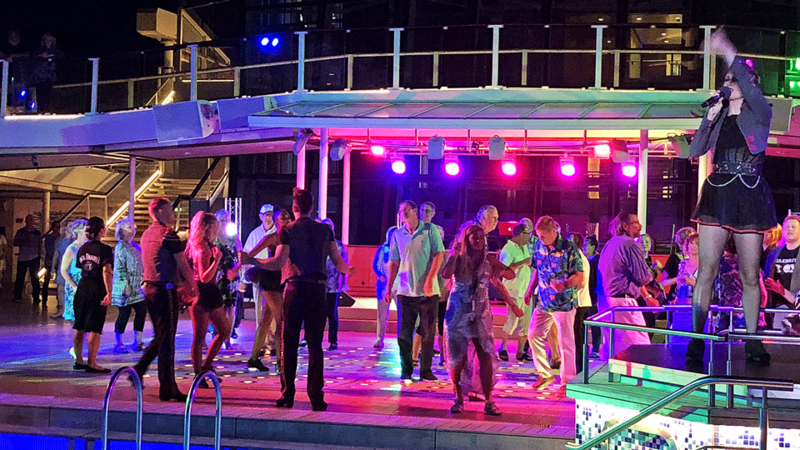 We had a BLAST at all the stops... and when we arrived back at the ship near midnight, the Equinox was already hosting it's own party with food and drinks around the main pool! It was an excellent day and an excellent night! 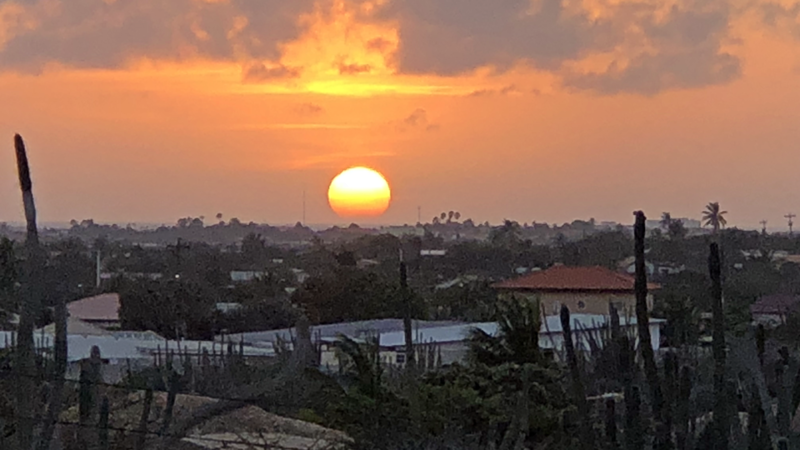 Aruba truly is One Happy Island! Our place on Palm Beach! Beautiful day! Diane and I at Palm Beach! RIU Aruba resort is behind us. One of two Kukookunuku buses in our dinner and roving bar crawl... so much FUN! 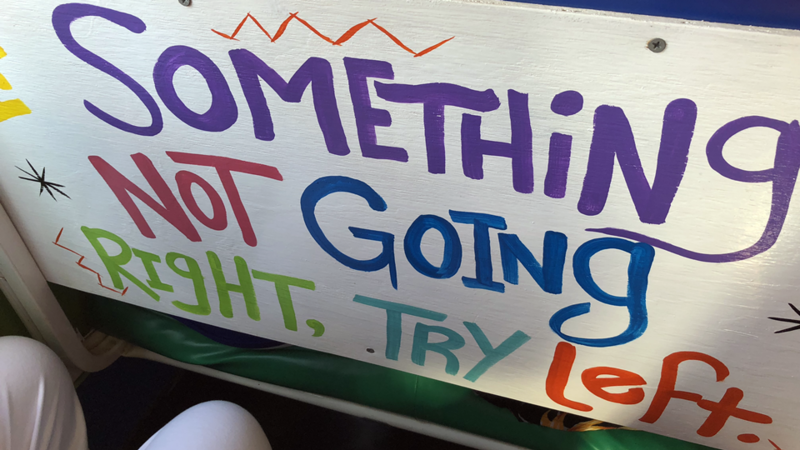 Words to live by... our Kukookunuku bus seat's inspirational message! 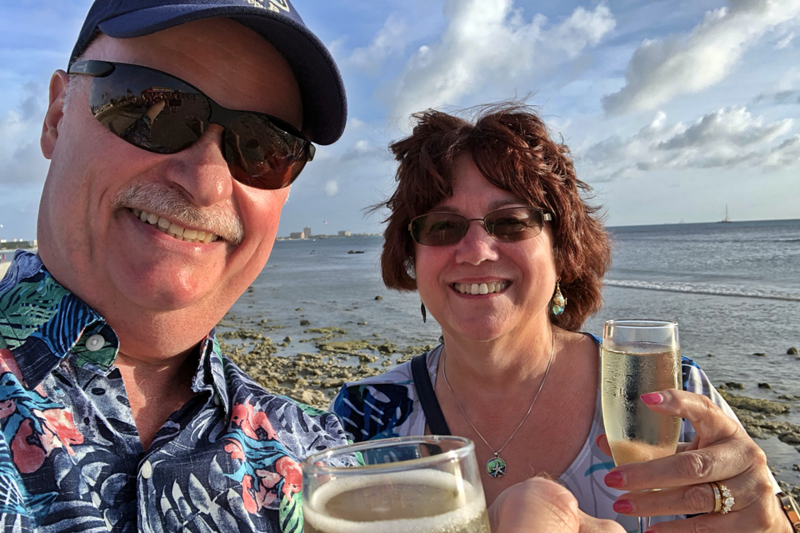 Champagne toast on a rocky Aruban beach somewhere... let the drinking begin! BBQ Dinner and Drinks (one free)! Patty and Jimmy and I leave our spouses behind and walk up the rock path to see the Sunset! You can see Liza at center left taking a picture of us and Diane smiling at us to her right and the back of Mac's head as he faces them. American southwest? Nope... Aruba central! Kukookunuku BBQ stop up high on the rock path looking away from the setting Sun! Zoomed in view of the Sun setting from our rocky high vantage point on the Kukookunuku Tour BBQ stop! Second KuKoo Bar Stop, awesome bottle chandelier and electric sliding... more drinking! Definitely forming great friendships by now! 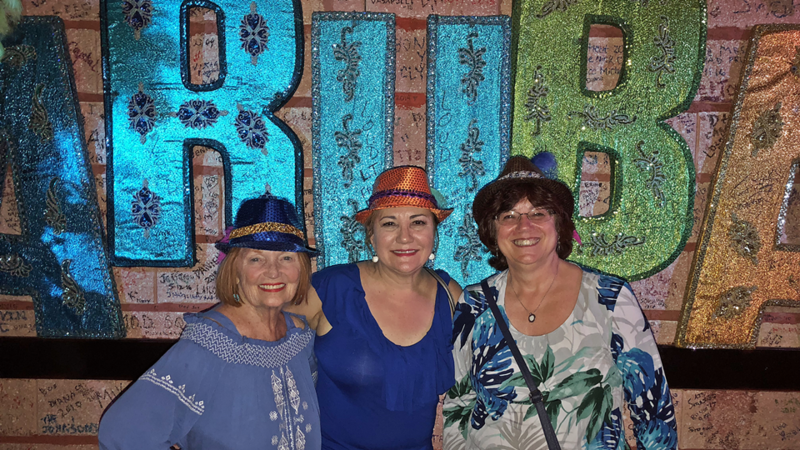 Third Kukoo bar... and the ladies have hats (bar property, but their hats for now)! None of us are feeling any pain... and we've got solid new friends now! So much fun!!! ... only to find a new party just starting at the ship's pool!!! Great night! 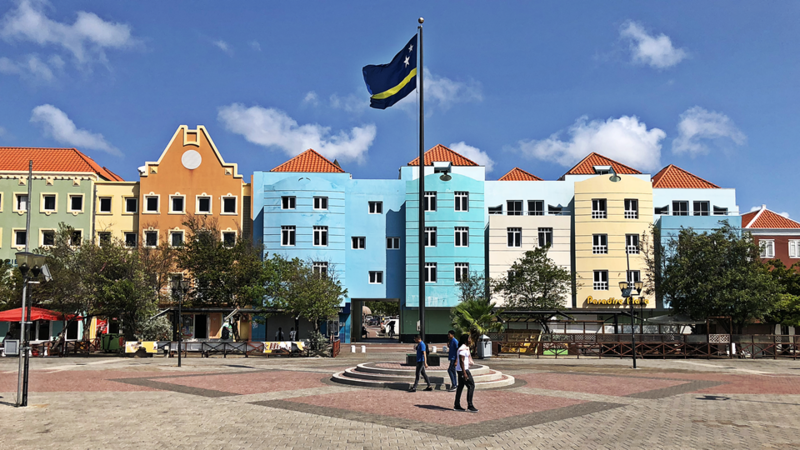 Curacao (April 11) We love Curacao... it's multicolor buildings and warm populace always makes us feel welcome. This day we were on a Celebrity excursion that took us over the extremely high Queen Juliana Bridge (you can't miss it from port) for a short tour before taking us to the Papagayo Beach Resort (See: https://www.papagayo.com/en/) where we had the use of the resort's nice sandy beach and "infinity" pool. There were assigned free lounge chairs and umbrellas for this tour, but we saw some more comfortable lounge beds with cool umbrellas and we upgraded (for a nominal fee) to these. There was a waiter that took drinks orders (not included) for us. There were shops and restaurants here as well. We were there for about three hours, and had a great time. After the resort, we were given another brief tour of the island on our way back to the ship. Upon returning to the ship, we went back aboard and enjoyed the buffet lunch there, then we went back down to the port for some shopping along the waterfront. (I found a new Curacao hat that replaced my worn and beat up Curacao hat purchased on a cruise there many years ago.) That night, all six of us had an amazing dinner in the Tuscan Grille and we enjoyed the night view through the floor to ceiling windows there as we departed Curacao. It was another fantastic day and night! When your cruise ship is one of the biggest buildings in Curacao... at least for a day! 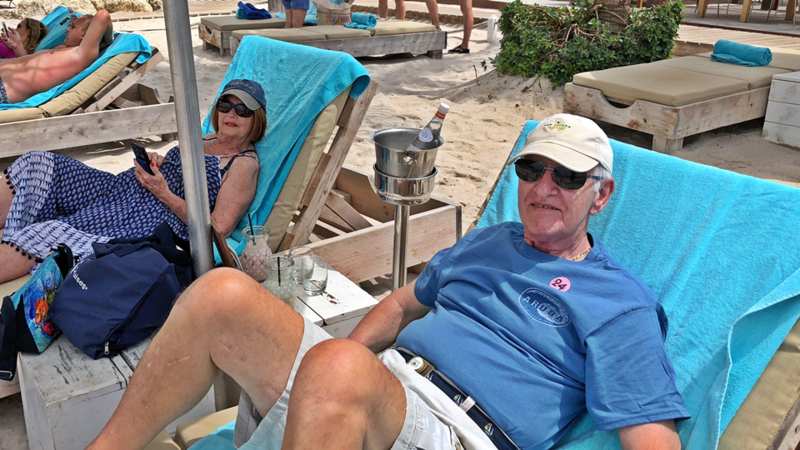 Patty and Mac in the cool chair upgrades at Papagayo Resort, Curacao! 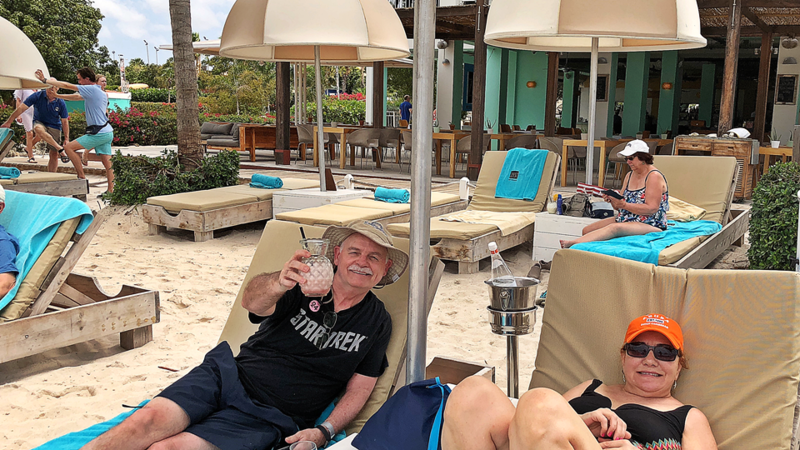 Jimmy and Liza (and Diane in the background above Liza) at Papagayo Resort, Curacao! Here, Lizard Lizard Lizard! 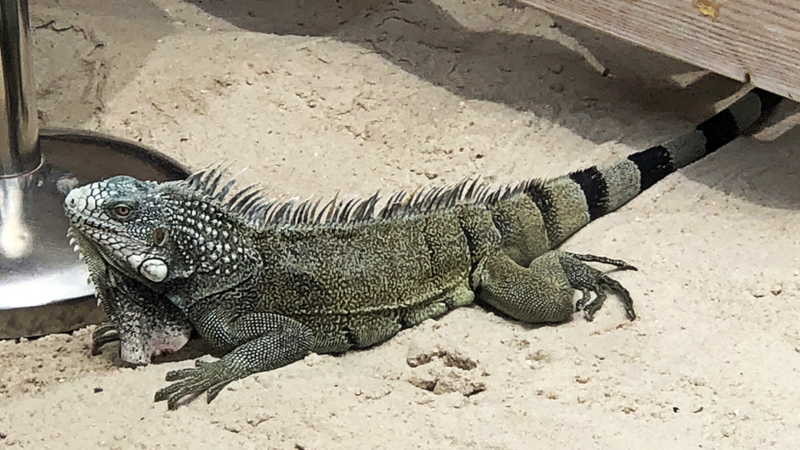 Cool cat sized Iguana (?) checking us out on it's beach! Papagayo Beach Resort: upgraded loungers to left, lousy loungers to right... Infinity Pool in foreground! 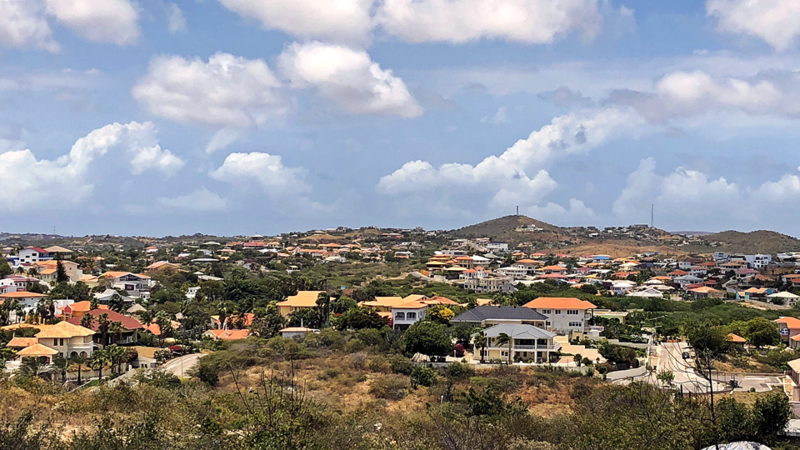 Curacao suburbia... beautiful homes and country side! Mountains of salt! 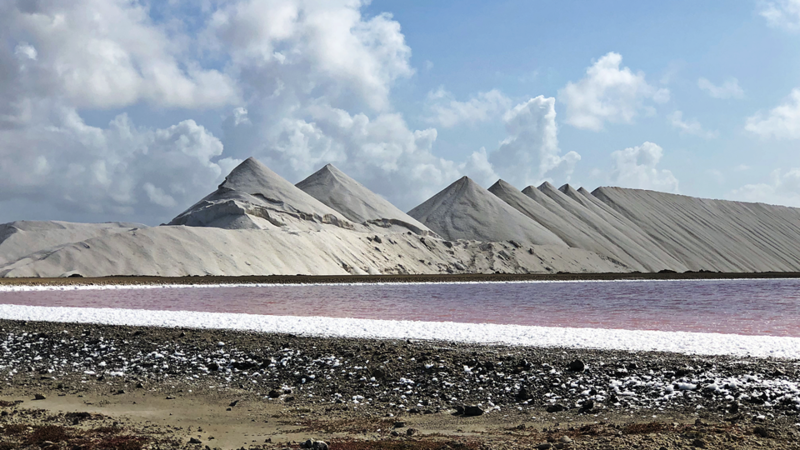 Bonaire salt production. Note salty build up on the water's edge! Former slave "homes"... a horrible existence they had! 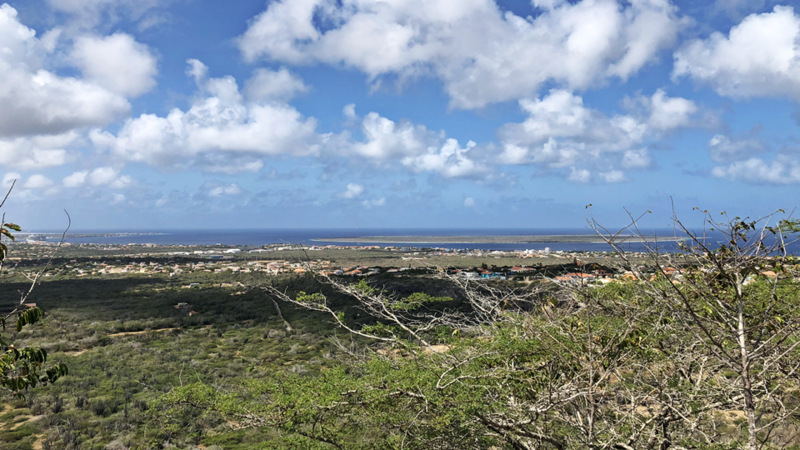 Bonaire country-side! Very pretty and rustic! A poolside party as we depart Bonaire with the Equinox singers and dancers! Poolside party as we leave Bonaire! Post cruise tour (Miami): Debarkation went smoothly. Patty and Mac were off the boat early and made a dash for Georgia where they attended a wedding in the late afternoon. Jimmy and Liza and Diane and I had a late flight (7pm) out of Ft. Lauderdale so we opted to do the Hop-on, Hop-off bus excursion offered by Celebrity. 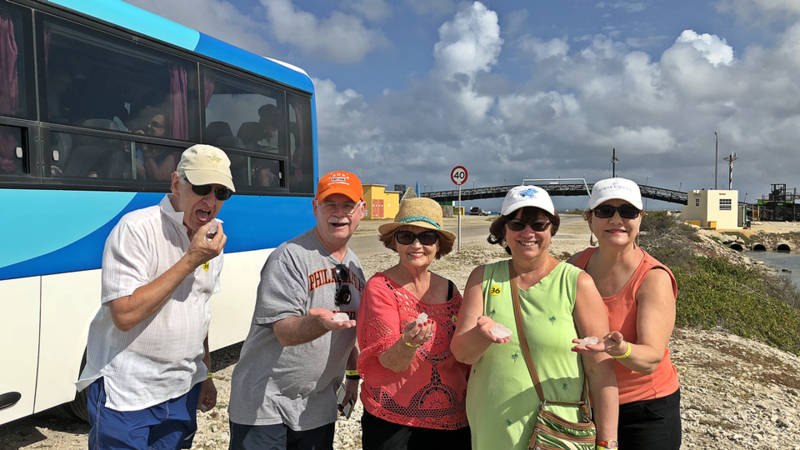 We liked this tour as they collected and held your luggage for you at the Miami Bayside Market where you would end the tour later that day and get your luggage and board a bus that took you back north to the Ft. Lauderdale airport. This is a much better plan than sitting around an airport from 9am till 7pm. This was a good tour but unfortunately it was top deck in the Sun, and there were major traffic delays so it became uncomfortably hot. The amiable narrator kept us entertained as the bus finally got us over to Miami Beach where we saw some old hotels and new hotels and a lot of touristy stuff. The bus does two major loops with the Bayside Market at it's hub. You can get on and off the bus anywhere along the route at stops and join another in their fleet. We opted to ride the first loop then we got off at the Bayside Market to use the restrooms there. The Bayside Market impressed us so much, that we spent the rest of the day there, having some drinks and a delicious meal at the Hard Rock restaurant (gorgeous place) and shopping and enjoying the views. Around 2:30 we went to the place to collect our luggage and then we boarded the bus back to Ft Lauderdale airport... about a 30 minute bus ride. I think anytime we have time to kill in Miami pre- or post cruise, we will spend time at the Bayside Market... an excellent venue with so much to do! Bravo, Celebrity Equinox! 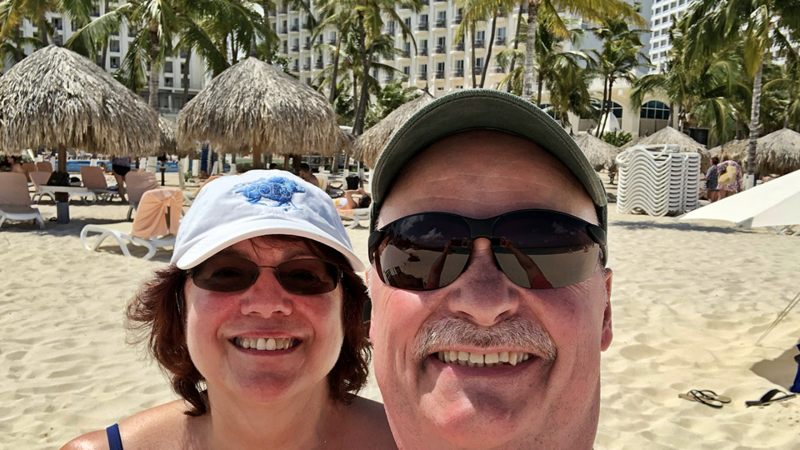 This was a fantastic cruise made perfect because it included our wonderful family and an outstanding itinerary... two days at sea traveling due south (with views of Cuba! ), the three ABC islands, and two days at sea going back north to Miami again. The ship was opulent, the food and service was five stars out of five all the way, and perfect weather to boot! We couldn't have asked for more! I'd do it all again in a heartbeat!